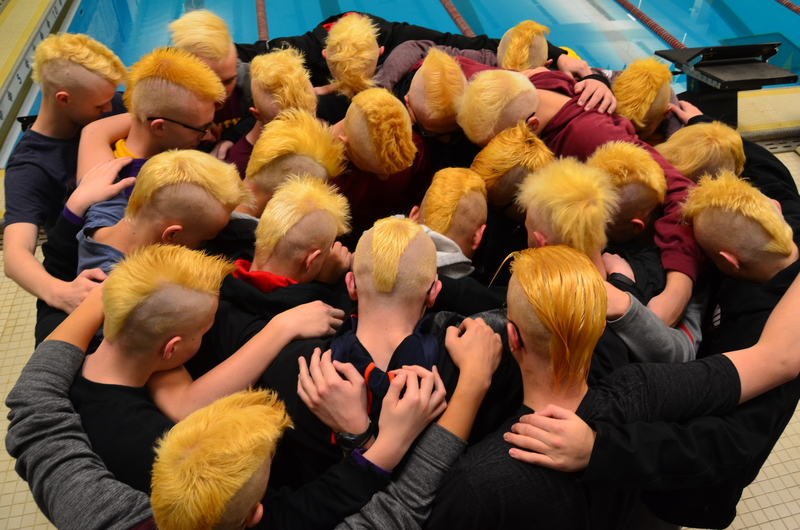 The men’s team has a long-standing tradition of making their hair crazy before the championship meet head-shaving. Some years it’s been dyed funky colors, other years it’s just been bleached. This year was bleached hair and mohawks! After a week of crazy hair, all the conference guys shaved their heads smooth for the big conference meet the next day! Below are pictures. Look for the districts to do the same next Friday night (Feb. 3). Below are some photos of the fun! More can be found on the team’s photo website (link in the upper right corner). Log-in to your Shutterfly account is required to download photos.